It is two weeks since the Uttarakhand tragedy unfolded. There are normally four kinds of people in a disaster: The victims and survivors, those who directly help in the relief and rescue work, those who indirectly help and there are hypocrites. Hypo-crises is simply hypocrisies in a crisis. The figure of deaths quoted by the Uttarakhand CM, their Speaker and Home Minister Shinde varies between 900 and over 10000. They are in grip of the situation. The biggest hypocrite in the whole episode undoubtedly is the darling of the media; Rahul Gandhi. 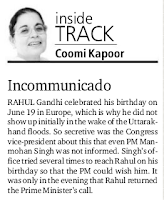 When the floods broke on June 15 RahulG had already made his plans for his birthday celebrations abroad. So, according to reports, he had dashed off to Spain. RG did once say that Indians are a hit in Spain too because they have Amitabh Bachchan posters in bars and clubs. There are reports that the Congress had loaded relief-trucks ready and waited 3 days for RG’s arrival to flag them off to UK. Well done, but it seems the trucks reached Rishikesh and then didn’t know where to go or what to do with the stuff. 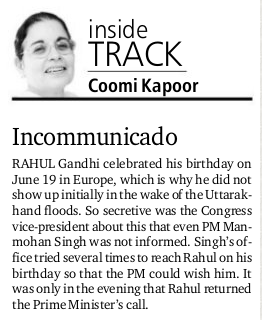 Writing in her column ‘Inside track’ in IE Coomi Kapoor notes that even the PM couldn’t reach RahulG in Spain for a while. By the way, the call wasn’t to ask RG to come back but to wish him happy birthday. When your country is in a crisis situation who're you gonna call? Ghostbusters? Of course, RahulG returned, rolled up his sleeves, and choppered his way to Uttarakhand. Did he help? Maybe, we don’t know. But we do know that he was a nuisance there too. The Congress party couldn’t help screaming that RG was in UK not as a VVIP but as a “common citizen”. Frankly, I don’t have anything in “common” with this chap. He goes there and the army had to displace a group of ITBP soldiers to accommodate his meagre life-style. From all the images I have only seen him talking to a few officials and his usual sycophants. The worst was exposed in a video on Youtube. A villager screams at the passing convoy of RahulG: “We are destroyed and these security people are chasing one man (RahulG)” to protect him. Predictably RahulG didn’t stop to pacify the group and moved on. Thankfully, all citizens aren’t as “common” as this insensitive lump of hypocrisy. Then there are those two channels from the unholy trinity, NDTV and CNN-IBN, who were raising funds for Uttarakhand. Both were promoting some Uday Foundation. As far as I know UF is a Delhi-based charity that works for children with birth-defects. It’s a noble thing to do but I didn’t know how they were going to help in UK. Still, there is some merit in promoting UF. But NDTV goes on to promote something called HopeTrust. Now this HopeTrust specialises in curing addictions with 5-star facilities. Look it up on the net. They aren’t even remotely connected with relief or rescue work in a crisis. These channels didn’t consider it fit to promote those charities that were already working in Uttarakhand on the ground. You can estimate a reason for it as good as anyone else. To their credit, many reporters from all channels did a wonderful job of reporting the tragedy at great personal difficulty and risk. They deserve our gratitude and applause. But there are some who continued with their hypocrisy and sheer nonsense even as the relief work was on. The first obviously has to be Rajdeep Sardesai. For much of the last 10 days he was missing in action. Reports suggest he was away at Manipal for his son’s admission to a medical course. Good to see Rajdeep’s son doing well but Rajdeep comes back and semonises like Moses as usual. 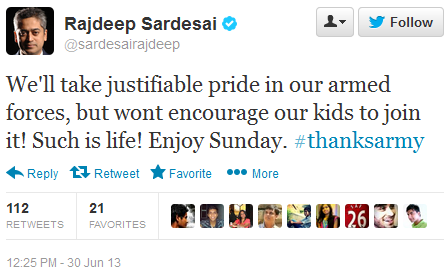 He wonders why people applaud the Army but don’t send their kids to the armed forces. At any other time this would have been a reasonable thing to say but tweeting it after he had just got his son into a medical course does sound like hypocrisy. Maybe Rajdeep was ‘introspecting’, we don’t know. If the great cricketer Dilip Sardesai had sent his son to the Army it would have been a great service to the nation. Now, don’t be silly enough to think or even suggest that she’s having a ball at the beach. She’s definitely not! 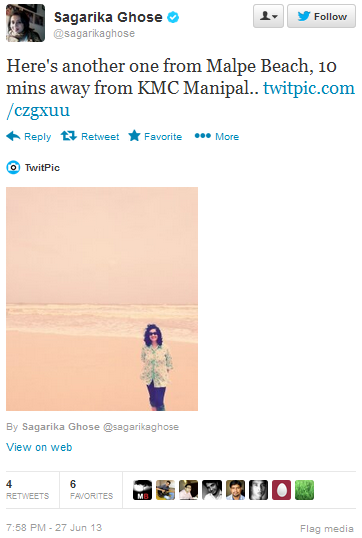 Sagarika used all her might and was keeping the sea at bay so that another Tsunami didn’t hit some part of India. Now that’s what I call proactive, preventive action. 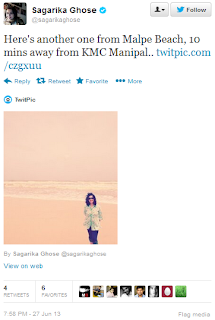 And as she says in her tweet it’s “another one”, so she saved Manipal from Tsunami from multiple disasters. Like twin sisters both NDTV and CNN-IBN also had similar names for the UK tragedy, both called it “Himalayan Tsunami”. NDTV in particular played up bogus CBI stuff on the Ishrat encounter case over and over again to cover up the failures of the UK and the Central govt in proper action in the relief and rescue work. There are damning reports that the UK govt had spent 50 crores on the media to cover up or suppress bad news about their bungling. There is a report on a website that explains how the govt not only spent money on the media but also to individual editors to play their line of reports. You can read it at International news and views but as the report cautions it is a private report. Finally, it’s not over until the fat lady sings as they. If you haven’t read “Indian media’s top 5 prayers” I recommend you do. So after many days since the UK tragedy broke Barkha Dutt packed her bags and off she went to Kedarnath and other places. A cheeky tweet by someone describes the possibilities well: “Bogged down with an avalanche of criticism Congress deploys its top diva journo for damage control”. As usual Barkha was there with groups and individuals doing her “human spirit” and “God” stories. She also suggests “Netas play politics” during a crisis. Well, what exactly do media people do? They used fake pics to report the flood and their hypocrisies in a disaster are pretty much evident. Despite of doing irrelevant tweets and crying foul after confrontation these journo dun even like questions/verification/ clarification to be ask on tweet. I have been reading your blogs from past 2 years. So am now aware of these hypocrites. But what about millions of viewers who do not know about you or twitter but just watch news for 2 hours after work in the night? Many of these good, educated, hard working friends of mine do not even know these things, at the most they say may be a little biased. Why cant BJP have a news channel? atleast to show videos like that of Rahul Gandhi's UK visit? If Cong is dominant in MSM then credit to them, they have better PR..We have Advani blogs against his own party, Yashwant sinha barks against Modi and so on.. isn't it the problem of BJP too for not properly highlighting misdeeds of Cong? Ex: 2G Scam What was BJP doing all the years until SSwamy went to court? Good Question ! I think the answer would be the BJP was waiting for someone to kickout Advani who was working on a hidden agenda to destroy BJP by making it sickular. Sathyaprakash, either you have not read it fully or unable to understand what Ravinar wants to say. He is not doing party politics. It is not about congi vs BJP. 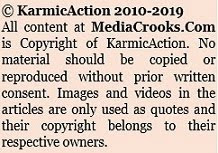 it is about crooks in the media who cooks stroies to suit their masters and preach as if they are reincarnation Jesus. Media is not doing the right kind of job, which is undemocratic. I agreed to all your points except Yashwant sinha barks against Modi.He never barked at Modi,but he combined many things at one but media published them selectively.Example UK flood relief.All He said is "no leader should politicize the relief operations",nothing wrong in his statement.But NDTV put it as "Sihnas veiled attack on Modi".This is how MSM twists the facts and create confusion among peoples. In my very first sentence I wrote about Media doing wrong job and its very well established through several instances from Radia tape to recent Sreenivasan Jain's "fake encounter" and "chota mota scam"... So by writing blogs, exposing in twitter people like us can only impact audience in SM. This sub set is small, MSM keep spinning the stories to far bigger viewership and SM keeps highlighting within this subset. Now how to you stop this 'undemocratic' thing? The only way is there must be some other news channel which highlight these hypocrisies.. This is possible only if there is a news channel from opposition party bcoz the ruling party has bought these existing MSMs. Hope you got my point. 'Sinha'is the exact point I am trying to say..MSM spinned what Sinha said but I don't know what he really said unless I take personal interest and dig the interview or wait for someone like MC to expose.. If there is another channel which exposes this I will come to know easily.. Once ppl like me start following the CREDIBLE news channel then automatically the TRP of channels like NDTV degrades.. then they will be forced to say the truth unless SoniaG has so much money to run a channel w/o ad. Although we as Indians today boast of more than 60% youth in our population, I have my own doubts about their smartness when it comes to politics and it importance. Most of the gen next that i have spoken to have no interest in politics and virtually in the dark about our history and the past.They treat politics as a hobby which may or may not be pursued just like a sport or a performing art.They dont realise that it is a necessity for their own future.They do not know who makes their lives miserable without jobs without infrastructure etc.They dont see the connect between our elected govt and their miseries.They do not know to read between the lines.They just believe that our country is like that and that they must quit this nation and head for greener pastures.One relevant eg I would like to give. Those who pass out with MBA and are managing companies do so from the comfort of their cabins by pressuring their subordinates to do jobs that they themselves have no idea about.They know nothing about local politics. It is purely pressure tactics.When the same company needs to get any services from a govt agency, these managers hide behind and send other lower level street smart staff to do the liason works and get the jobs done. They always operate from behind since they are not aware of how to bribe govt servants and get their jobs done. It is always an easy life.Most of the IT industries have very little to do with local govt agencies.So these so called upwardly mobile group are not really tested for their smartness in dealing with human affairs.They are only going by what they have learnt in class rooms. 1) I am doing what I can, Infact I was the one who twitted you RahulG's video, you posted it after 4 min and thanks for that. I wanted it to go to as many ppl as possible. 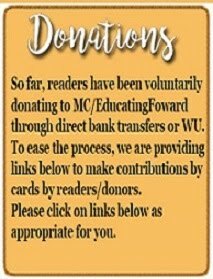 May be you would have received thru other sources as well. 2) Am not suggesting to educate "millions" but expecting the main opposition party to 'do their bit'. Else there will always be a RACE CONDITION between SM and MSM.. I saw Yashwant sinha's statement, when asked whether there should be politics over some tragedy, he simply said 'no..'. What else anybody could have said? He also said lot of negative things about the congress thereafter, which headlines today somehow did not highlight. People, by and large, are not as gullible as you are thinking. Even if most of the people do not spend their time on the internet but they are smart enough to differentiate who is crook and who is not. Awesome article!!! With every post Ravinar proves that "Keyboard is mightier than sword"... If I were Burkha, Rajdeep, or Sagarika, I would have packed my baggage and left for Kashi/Jerusalem yatra. Alas they have sold their teeny weeny souls and are fulfilling small mission; paycheck to paycheck.. Thanks Ravinar...keep up the good work. Story I heard from Patna that once Lalu was sick, he was examined by hid daughter, a doctor who had topped the MBBS final exam during his Raj. Lalu, being a wise man, refused to take medications the daughter had prescribed. I am sure Number Unno and his Devout Hindu wife will be more trusting of this child. Thanks Ravi, Good one. It is a shame that most of the Indians are not sensitive about disability. I have decided to join them as well and am proud to add two others to join Priya's Three A$$ club. No doubt they are Ladies on Twits! Just below your blog was an AdChoices adv. of Burso's Bunga party. Lots of beauties and a few looked like Burqa, Sogharikha, Neeedddhhi and Kahsishhh. Wonder how much money they earned? More than they are paid by Congress, I hope! Great article Ravi, Hard hitting and up to the mark. Parents do not send their children to join Army or Airforce or Navy because the salary is less, whatever respect that govt promises for a soldier is never implemented except for crocodile tears and ceremonial honors, and absolutely NO support to the soldier's family. The Congress govt is yet to compensate for the police or security personnel who last their lives in protecting the parliament attack. The paradox is Congress claims parliament is supreme and hence no need for any compensation. Nice one as always! Rajdeep sardesai is one big hypocrite that no one can beat him! Would this guy ever fight for the legalised rights of the retired soldiers through his media? Big Question? I went to Spain for an official event and after that I stayed there for an appointment with a Brain doctor. It went well. Ravinar , your articles are a treat to read! Consider myself blessed in this respect! But am sad that so many literate indians are missing out on these gems!